If you follow me on Instagram, you have probably see me visiting Hydra a few times over the last few weeks. Hydra is one of my favourite destinations close to Athens. It is peaceful, quite, artistic and amazingly picturesque. I adore the atmosphere of the island and is the perfect destination to clear my mind and get inspired. I never go to Hydra with a plan. I just walk around and get surprised by the beauty of the island on each corner. I feel the atmosphere of the island from the moment I set foot on it and it immediately slows me down. This might also be a side effect of the boat trip which always makes me feel a bit mellow or seasick. It can also be the lack of cars as these are not allowed on the island. Transport is only possible by sea taxi, a donkey ride or of course, on your own feet. In any case, once I start walking around on the island I feel peaceful, relax and inspired. 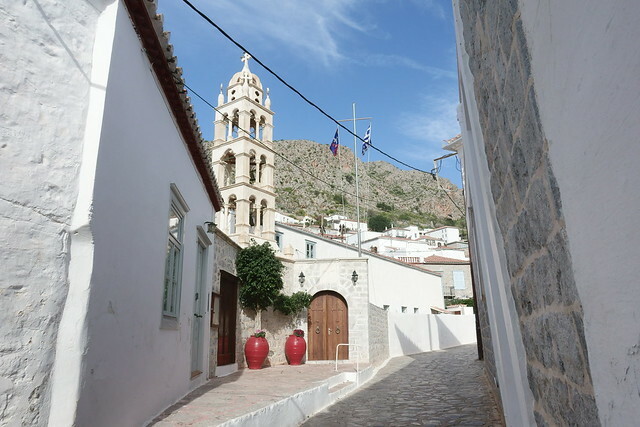 Hydra is a perfect destination for a day trip from Athens. As the city is always busy it can be really nice to escape the noisy city for a while. But also when you are looking for a quite destinations to recuperate and relax, but you prefer a place not filled with tourists, Hydra is perfect. Most tourists are Greek or one day visitors. The island is not as close to Athens as Aegina which makes it less common for tourists to go here for a day trip. Aegina, especially at the port, can be crowded with groups of tourists coming with an organized bus trip, but I have never seen these kind of groups in Hydra. Bonus fact: The island is named after the Greek mythical creature The Lernaean Hydra. A serpentine water monster eventually killed by Hercules with a sword and fire. The water monster had several heads and each time a head was chopped of, several heads would grow back. Hercules killed the Hydra by searing the wound that was created by chopping of a head. As I mentioned before, I never visit Hydra with a plan. I just walk around and see where I end up. Because of this I haven’t seen everything on the island jet, but I would love to share my favourite parts of the island with you. 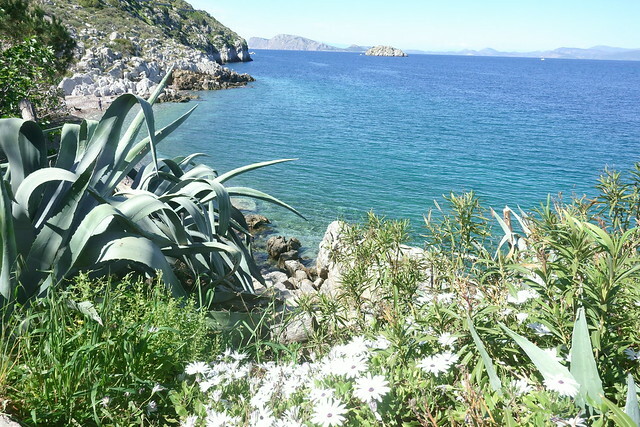 I prefer to start with a walk at the coastline of Hydra. 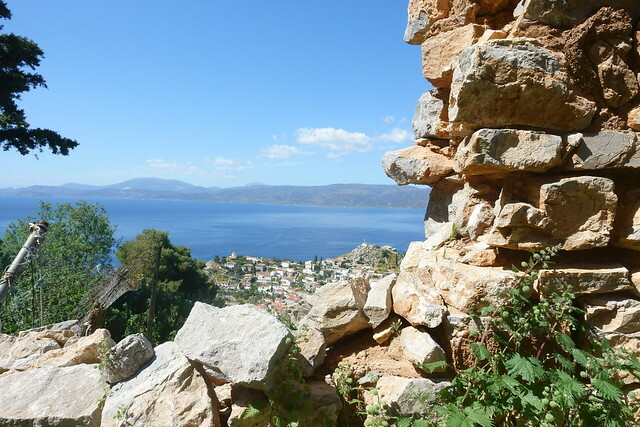 I walk to the nearby villages and enjoy the stunning views on the sea and the Peloponnese. As the island is pretty windy most of the time I have to be careful not to get burned. But the summer breeze is one of the things that makes it so relaxed to be on the island during summer days. Several tavernas and bars are located at the coastline. All of them provide you with relaxing seats and beautiful views. My favourite time of the year to visit the island is during spring. At this time the coastline is filled with beautiful flowers it is still green and not dried out jet and also you can smell the spring in the air, which always makes me feel extremely lucky. 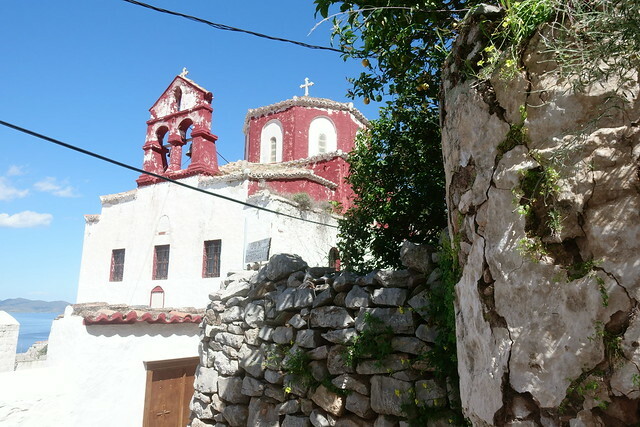 Hydra has several monasteries to visit, you can find an overview of them all in the link at the end of my page. However, I have two favourties. The Cathedral of Hydra, which is located at the port and Ipapantie, with its lovely red colours. I admire the huge eye catching clock tower of the Cathedral of Hydra which gives me an Italian feeling. In any case, I think Greek monasteries are wonderful and I definitely recommend you to visit at least one of the monasteries. The combination of the relaxing Greek habit, the peaceful island atmosphere and the blissful atmosphere of the monasteries are one of a kind and really incredible. Historical fact: Greek monasteries have had an important role during several time periods in protecting the Greek Orthodox religion and the Greek culture. A lot of valuable historical treasures are kept saved in the monasteries and teach us about the Greek culture, history, the growth of the Greek Orthodox church and even the growth of Christianity. Some of these treasures can be admired in the museums of the monasteries. I did learn a lot about the history and origin of my own religion during the visits at the monasteries, but also as a history lover those visits where very valuable for me. A visit to a Greek monastery is not only a spiritual experience, but also an informative and artistic experience. 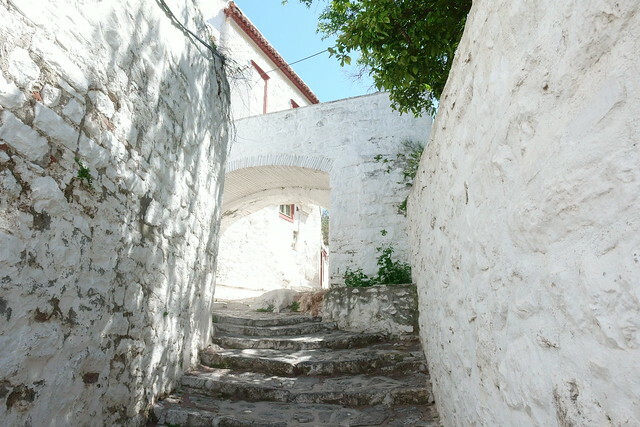 The streets of Hydra are extremely picturesque. I love to walk around these small and gorgeous streets and I can’t help myself to stop and take a picture at each corner. Although the city is quite small and I have visited the city a few times now, I still get surprised by new lovely views or doorsteps every time I visit the island. Also, there are some lovely shops in the streets close to the harbor. I personally love to visit one of those shops that sells nuts and dried food. You can try some of them and decide which one you prefer. The caramelized almonds are delicious (not that healthy though). 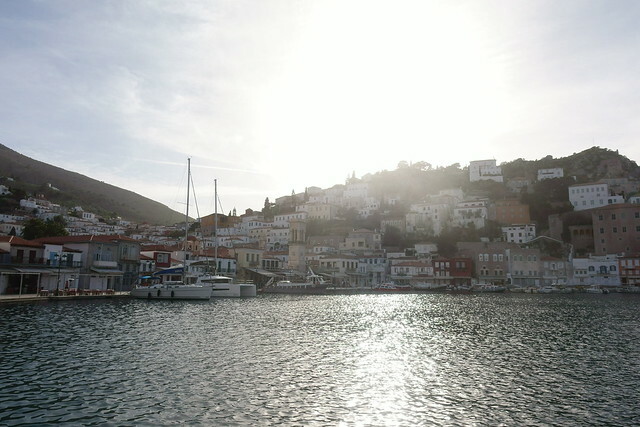 The port of Hydra is filled with inviting restaurants and bars. It’s the perfect place for a refreshing drink. When I arrive at Hydra I prefer to eat something small before starting to walk around. I mostly choose a restaurant that offers breakfast so I can start my day at Hydra with Greek yogurt, honey and some delicious fruits. Definitely one of my favourite things in Greece. While eating my fruits I have an amazing view on the clear blue sea, the gorgeous houses of Hydra and the people passing by. During one of my visits I decided to walk upwards. I did this visit together with my family, who were visiting me for a weekend. There was this cute church that I definitely wanted to see from a bit closer. It was a gorgeous walk through the small streets an cute houses. Once we reached my goal we decided to walk a bit further upwards. My family loves walking through the mountains as they mainly used to walk through the Alpen. We achieved a point where there wasn’t really a road anymore. We were walking through a meadow and as spring just started it was filled with adorable flowers. Also the view on the rest of the island was just stunning. We walked until we achieved some kind of old ruin from where we had the best view so far. It was a real adventurists walk and absolutely worth the views. There are no cars allowed at the island (only for the garbage man, the ambulance and the firemen). This is something to think of if you are planning to see more than only the port of Hydra. It is optional to pay for a donkey ride, but I personally do not like the idea of using animals for tourism. So if you are planning to see some parts on the middle of the island, keep in mind that you have to walk, I see this as some creative and better kind of fitness. Also water taxis are available. How to get there: Hydra is only accessible by boat. To be more specific, only hydrofoils (a smaller and faster ferry) go to Hydra. If you get easily seasick (as I do) I would suggest you to take some medicine before you get on board. Boats to Hydra leave from Athens, Poros and Hermioni. At the end of this page I have put a link where you can make a reservation for the ferry. Of course it is also optional to come with an private boat. Prices for food: A cheap meal will cost about €10,- and a Gyros lunch will cost about €4,- and a complete dinner will cost about €20,- to €30,. As Hydra is known as a luxury island prices can highly variate, but as most restaurants have an menu at the entrance you can check the prices before you decide where to eat. 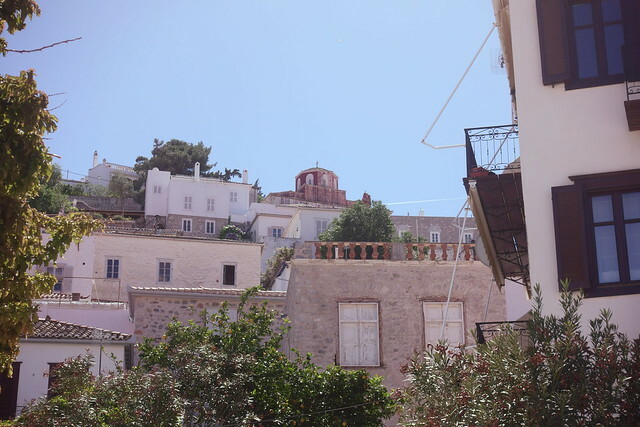 How much time to you need: I only made a few day trips to Hydra and to see the city alone that could be enough. You can experience some of the Greek island atmosphere and escape noisy Athens for a while. However, Hydra is the kind of island to relax and enjoy the Greek sun and Greek island atmosphere and if that is what you are looking for, you can easily spend one week on the island. Get inspired by the car free island. Sit down for a while and listen to the birds, the sea and the people laughing. It is amazing to be on a place where there is no sound of cars or motorcycles or whatsoever, not ever somewhere in the distance. Don’t make a plan! Hydra is not the kind of island you go to, to see a lot or do a lot. It is an island to relax and get inspired. It doesn’t have real highlights, the Island itself is the highlight and the best way to explore and experience it is by just walking around.